At Hearing On 'Muslim Radicalization,' Emotional Testimony From Rep. Ellison : The Two-Way The lawmaker, one of two Muslims in Congress, broke into tears as he spoke of the sacrifice made on Sept. 11, 2001, by a Muslim paramedic in New York — and the smears afterward about that man. Hear his remarks. 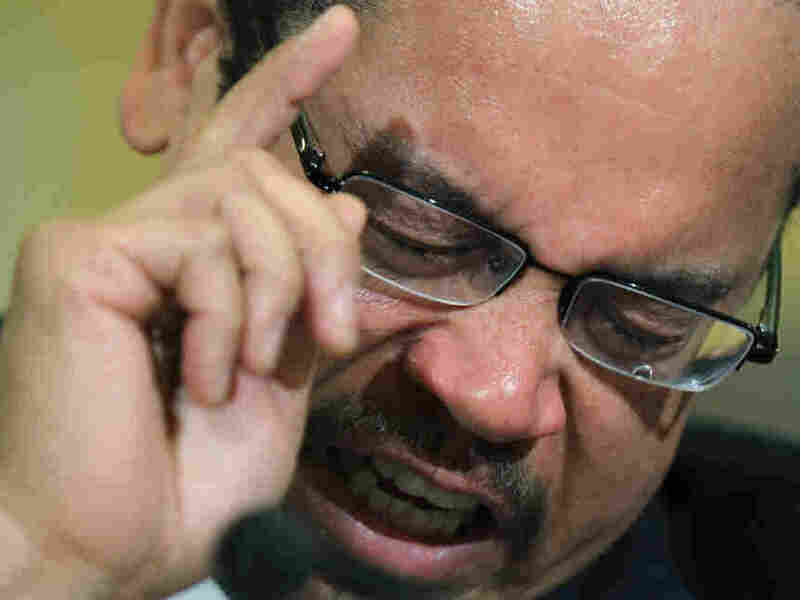 As Rep. Keith Ellison grew more emotional this morning, a tear fell on his glasses. The House Committee on Homeland Security's hearing on what Chairman Peter King (R-NY) says is the domestic threat from "Muslim radicalization" continues on Capitol Hill. One noteworthy moment so far came toward the end of testimony from Rep. Keith Ellison (D-MN), the first Muslim member of Congress. Breaking into tears, Ellison spoke about Mohammad Salman Hamdani, a New York City paramedic who died on Sept. 11, 2001, as he tried to help near the north tower of Manhattan's World Trade Center following the terrorist attacks. "Mr. Hamdani bravely sacrificed his life to try to help others on 9/11," Ellison said. "After the tragedy," Ellison continued, his voice breaking, "some people tried to smear his character ... solely because of his Islamic faith. Some people spread false rumors and speculated that he was in league with the attackers because he was a Muslim. But it was only when his remains were identified that these lies were exposed. Mohammad Salman Hamdani was a fellow American who gave his life for other Americans. His life should not be identified as just a member of an ethnic group or just a member of a religion, but as an American who gave everything for his fellow Americans." We'll have more from the hearing later. Update at 1:10 p.m. ET: We've added posts on one father's warning about how his son was "programmed" to kill and King's vow not to surrender to "political correctness."